After a lot of rain last week (5″ in 48 hours, plus more during the week), we are having a nicer week this time around. Temps are lower, A/C is off, windows are open. All good! Last Wednesday, the grands were over. 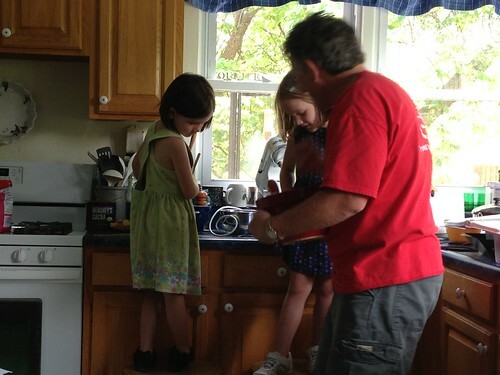 They helped Pa make brownies. Always fun! He happened to flip a bit of dough onto Rose Red’s show, much to her consternation. But they all agreed the brownies were delicious. 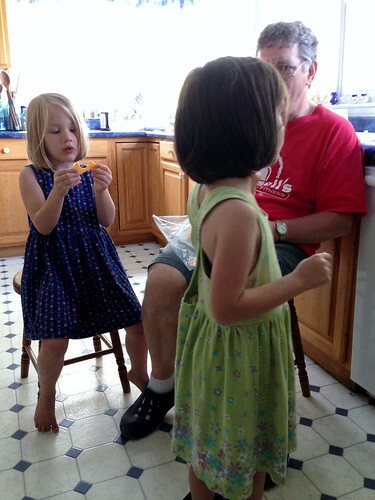 When Pa asked if they wanted sharp cheddar cheese for a snack, Rose Red asked if the corners were sharp. Thankfully, not. 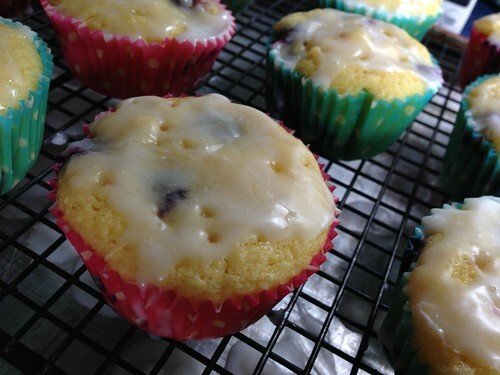 Today, I made blueberry muffins…more like blueberry cupcakes. They’ll be a nice snack later in the evening or with a cup of coffee for breakfast. I used the recipe from Sweet Pea’s Kitchen blog. Made mine with light sour cream instead of yogurt, baked them at 350 for 23 minutes. I skipped the sugar syrup step and poured the lemon glaze on while the muffins were still warm. Here’s the menu for this week. Salmon and shrimp early on, as DD brought it home from the city when she came by over the weekend. Need to use it first. Sunday ~ Church Picnic at our house / Eveyone brings dishes to share. Sausage/Potato Crock Pot Scroll down the page for the crock pot directions. This entry was written by ~~Rhonda, posted on June 4, 2013 at 5:34 pm, filed under menu. Bookmark the permalink. Follow any comments here with the RSS feed for this post. Post a comment or leave a trackback: Trackback URL. Yum. Your menus always make me hungry. I sure need to try a “plan”….get tired of the same stuff for dinner! I still need to try your tacoritos,they sounds soo good and I just know my finance would love them. They all sound good! I couldn’t just pick one. Haha!!!! How do you do the stir fry zucchini? Wish we could be there for the picnic. Miss you all!